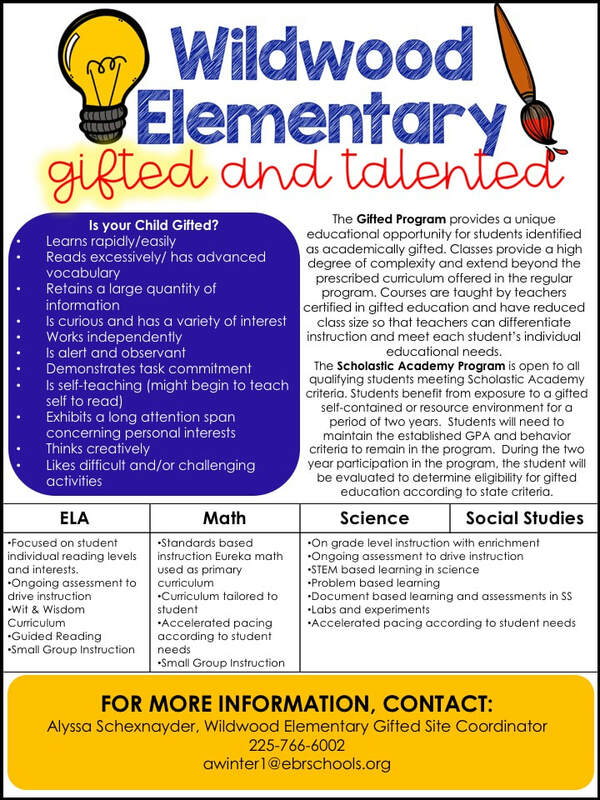 The Gifted Program provides a unique educational opportunity for students identified as academically gifted. Classes provide a high degree of complexity and extend beyond the prescribed curriculum offered in the regular program. Courses are taught by teachers certified in gifted education and have reduced class size so that teachers can differentiate instruction and meet each student’s individual educational needs. The Scholastic Academy Program is open to all qualifying students meeting Scholastic Academy criteria. Students benefit from exposure to a gifted self-contained or resource environment for a period of two years. Students will need to maintain the established GPA and behavior criteria to remain in the program. During the two year participation in the program, the student will be evaluated to determine eligibility for gifted education according to state criteria. The Talented Arts Program (Visual Arts, Talented Theatre, and Talented Music) is an educational program for students identified as talented visual arts, music, or theatre in grades K-12 and enrolled in the East Baton Rouge School System. Classes in these disciplines are designed to provide experiences that enable the talented student to further develop demonstrated skill, increase discipline knowledge, and grow as an artist.